Disney animated comedy spin-off of 'Cars' (2006) and its sequel. In 'Planes' (2013) crop dusting plane Dusty (voice of Dane Cook) hopes to become a competitor in high-flying races but is afraid of heights. With the help of US Navy veteran Skipper (Stacy Keach), Dusty trains for the upcoming around-the-world competition and learns to overcome his fear. However, he will have to face a tough opponent in defending champion Ripslinger (Roger Craig Smith), who will do anything to make sure Dusty doesn't win. 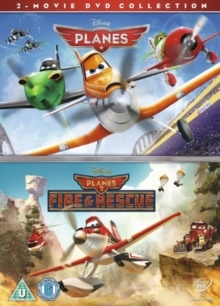 In 'Planes: Fire and Rescue' (2014), when world-famous air racer Dusty gets told his engine is damaged and that he may never race again, he refuses to let go and launches head first into the world of aerial firefighting. Joining the ranks of veteran fire and rescue helicopter Blade Ranger (Ed Harris), Dusty begins his training to become a real hero.